The WCHS Varsity and Jr. 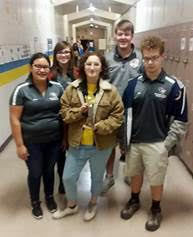 Varsity Scholars Bowl team competed in a tournament at St. Xavier's in Junction City on Thursday, November 16. The Varsity competed in a 9-team tournament and placed 3rd, receiving a trophy. The team answered 56 questions throughout the tournament and ended with a 7-2 record, losing in close matches to Herrington and Onaga. Onaga won the tournament with Herrington placing 2nd. Leading the team in scoring was Sophomore Jake Toole with 37 questions, followed by Senior Hannah Portenier with 10. The Varsity team members were Hannah Portenier, Malari L’Ecuyer, Jake Toole, Julisa Martinez, and Kody Helms. Other teams competing were Herrington, Valley Heights, Southern Cloud, Glasco, Hope, St. Xavier, Onaga and Northern Heights. The JV competed in a 6-team double round robin tournament and finished with a 2 -8 record. The team was led in scoring by Freshman Addison Mann with 17 questions, followed closely by Sophomore Emma Portenier with 13. JV team members were Emma Portenier, Garrett Kohlmeyer, Addison Mann, Shirley Mueller, and Kristen Ouellette. Other teams participating were Clifton-Clyde, Riley County, Thomas Moore Prep, St. Xavier, and South County.